THE RACING HAS BEEN HOT HOT HOT IN QUEENSLAND SO FAR THIS YEAR AND TEAM DALBY HAS BEEN OUT THERE GIVING IT THEIR BEST - HERE'S SOME RESULTS. Nathan O’Neill Classic Mt Tyson 1st April. 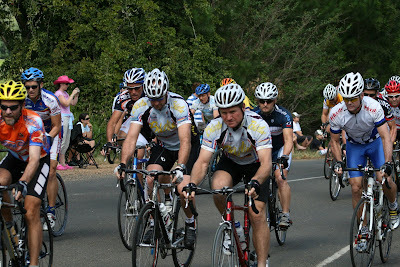 Road RaceOnce again our local legends lined up for this extremely tough race. Damo, Andrea, Luke, Cookie and Nolesy in Masters C and Brady in Elite B. Conditions were very fair, much better than lasts year’s heat wave. Damo was out after only 5km with a flat, Andrea powered on but pulled out to keep the coast clear. Luke, Cookie and Nolesy kept the dream alive with a blistering display in the final sprint for the line which saw Nolesy nearly end up in the gravel… Luke in 8th, Nolesy in 10th TOP TEN ! And Cookie 15th with the lead pack. Brady placed 6th in the 100km race. Awesome work boys. Wow, what a weekend… 5 races in 4 days !! Friday: Time Trial at Mudjimba, Saturday: Road Race at Tinbeerwah, Sunday: Hill Climb at Montville & Road Race at North Arm and finally another road race at Eumundi on Monday. Talk about hectic. Each section is timed with a timing device on the bike and at the end of the weekend who ever has the fastest times overall, WINS! Everyone got off to a great start in the time trial, Andrea finished 4th and the boys did well also. Tinbeerwah was a very hard course with traffic making it very difficult in spots as Cookie will only be too happy to tell you. 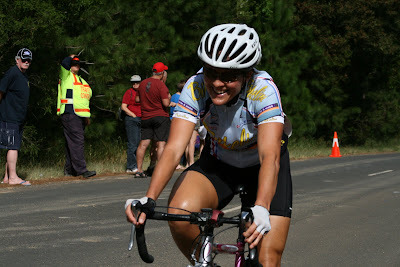 Andrea again displayed courage with some awesome leads in the Masters Ladies, finishing 10th. Cookie almost came up with the goods in the final Km but due to non road closure a car forced him down the wrong track and most definitely cost him a place. Nolesy and Luke came to grief on the course, hitting the tarmac and leaving a nice skin donation.. Both boys still finished extremely well in Masters C. Brady road an excellent race and was in 2nd spot coming into the final turn and held off most of the pack finishing in 8th. The Hill climb was certainly a toughie. Especially with a belly full of Easter Eggs.. 7km straight up… Andrea was 5th up the hill for the girls, Cookie was on fire from the previous day’s stuff up and finished a staggering 6th with Nolesy and Luke in the mid 20’s, Brady also had a great climb and finished with the top dogs in 9th. Eumundi.. This was a tough course with lots of hills. The Masters Ladies were the first to go with Andrea’s overall classification looking good she wanted to finish well and she did just that taking 8th. Cookie was also in the trophy hunt and had to put a big effort in the hold his overall position, he finished 2nd with Nolesy in 12th and Luke 34th, the weekend’s hectic racing taking its toll. Brady was still looking favourable also in the Elite B camp and needed to finish well to hold his 8th overall all. The finish was all over the place with top riders which includes Brady opting out of the sprint for their own safety, he finished 14th. Overall results were: Master Ladies Andrea Gormley 4th. Cookie is getting a reputation, he won again!! And he takes the SEQ Tour Leaders Jersey, well done …Nolesy is also getting used to being up the ‘business end’ finishing 9th. Brady is looking the goods in the overall SEQ Tours points for his Elite B Category, with an awesome display of strength at this race he finished 6th. TREK TOUR 21st & 22nd April. Lakeside. 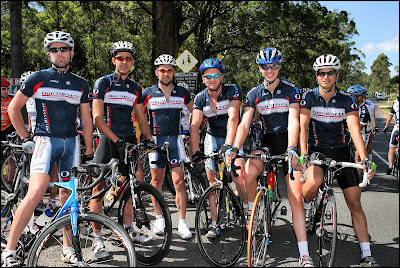 The Trek Tour consists of 3 races, a Time Trial, Crit and Road race all held at the former race way Lakeside. Cookie took out overall honours in the Masters C category showing everyone that you don’t need to shave your legs to go fast. Luke also finished well taking 4th. Brady again came up with the Mr Consistency goods finishing 4th. This was Jacob Rowney’s first dose of racing in the U/13 category and he showed top form being consistent in all 3 races, this one will be one to watch. A great start Jacob, well done. Anzac 25. 25th April @ Lakeside. A few of the boys headed back down to Lakeside for the ANZAC 25. With Cookie now bumped up to Masters B, we were all interested in what he could do. Well, he’s just a smarty pants, he came 2nd !! Our Master C boys were also pulling the punches with vital SEQ Tour points up for grabs, Luke toughed it out to finish 6th and Nolesy 8th. Brady just about had the crowd on their knees with a blistering effort in various break aways and chases to finish up with a very respectable 8th. 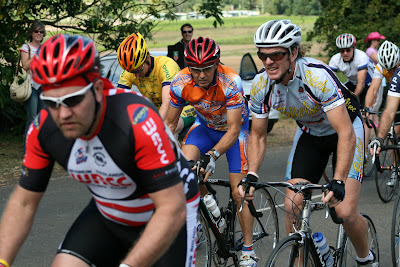 Young Jacob Rowney started the ball rolling for the Dalby crew taking part in this tight hot dog circuit crit. Jacob raced an excellent race and was extremely unfortunate to get pipped on the line and into 2nd place. Good work buddy. Luke and Nolesy were next up on this tough little course, the race came down to the bunch sprint and Nolesy backed himself the whole way to come home in 2nd and Luke not far behind in 5th. Cookie’s face told the story in the Masters B race, hot, hard and hurt….although that did not deter our resident tough guy and he finished in 5th. Brady went out with all guns blazing in his race, the race was filled with the best Elite B has to offer and they were not shy it sorting the men from the boys. Brady raced very well and had an explosive sprint to miss by a whisker and claim 2nd. Great results for such a tough circuit.